Already listed with our Phuket boxing stadium directory? "The Art of the Eight Limbs"or known as a charming traditional Thai boxing which is famous all over the world. Phuket Thai boxing stadium provides to all Thai boxing lovers. 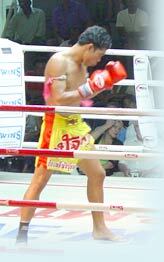 Any highlight matches of the day in Phuket you will found here as well as Thai boxing school in Phuket also offers on this island. Visit Patong Park and enjoy Bungy Jump, Mini-Boxing Stadium, Bowling, Snooker, and Thai Boxing, for school and corporate events.